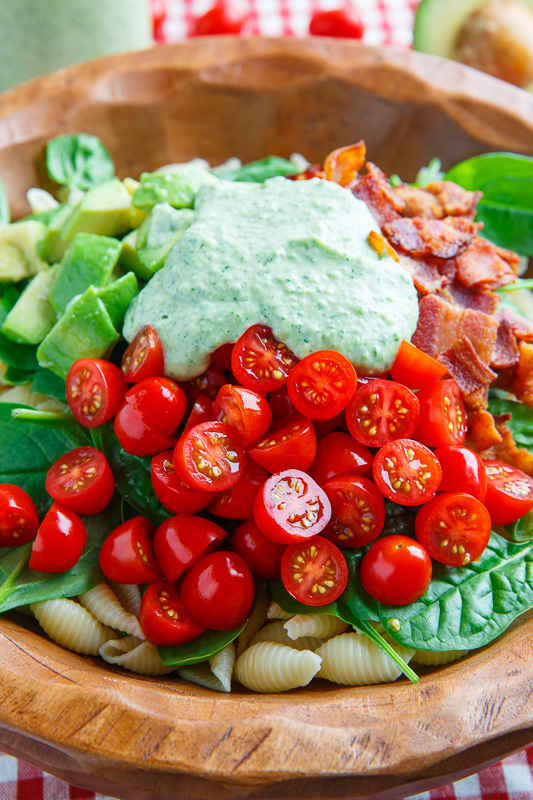 A BLT inspired pasta salad with bacon, baby spinach, tomato and diced avocado in a creamy avocado dressing (aka a Buttermilk Gucamole Dressing). I can’t believe that summer is going by so quickly! This weekend is the last long weekend of the summer and it’s a great opportunity to get outdoors and enjoy the warm weather while it lasts! 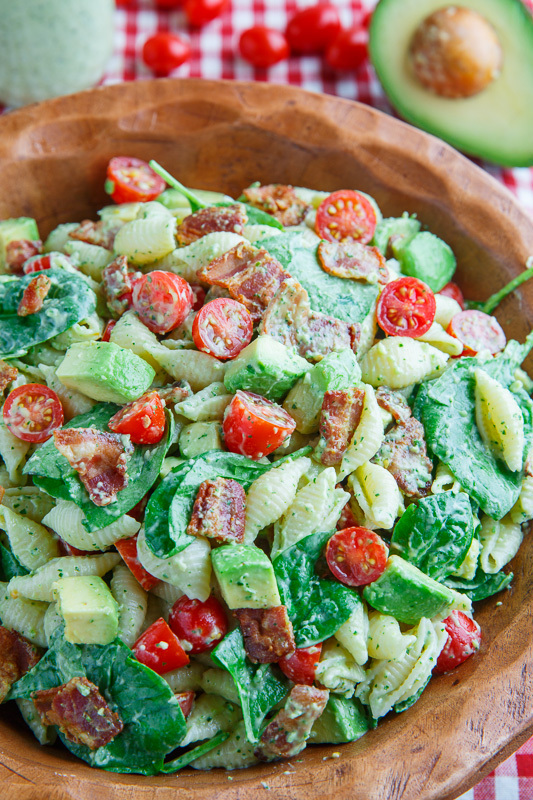 If you are planning on having a picnic, throwing a party of having a get together do I ever have a tasty dish for you, an avocado BLT pasta salad! 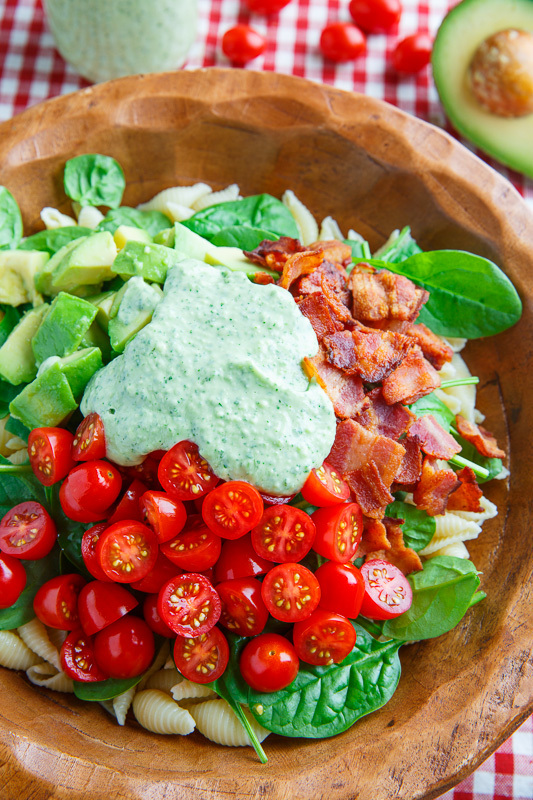 This pasta salad is inspired by the BLT, a bacon, lettuce and tomato sandwich, which only gets better with avocado so this pasta salad contains all of those ingredients along with pasta. Instead of going with regular lettuce I decided to go with baby spinach but otherwise the ingredients are the standard bacon, tomato and avocado. I don’t think that you can ever have too much avocado so I went with my favourite creamy guacamole dressing which is a guacamole themed dressing with buttermilk that is so creamy and good! 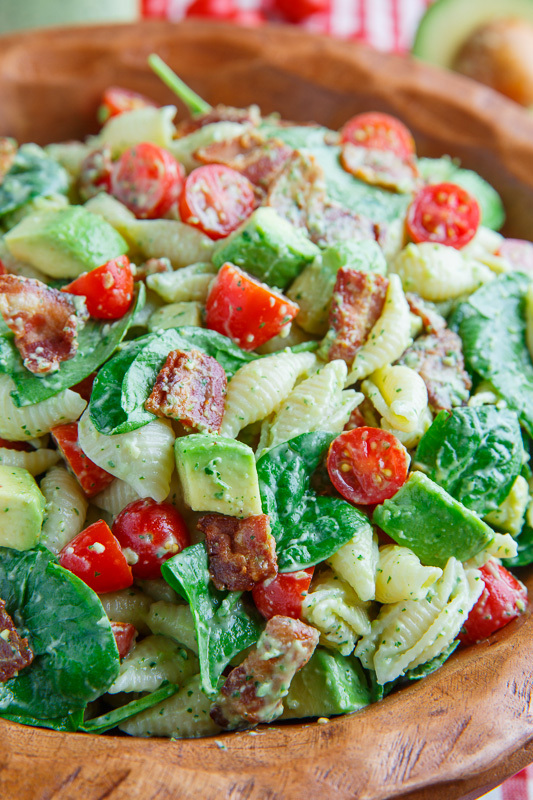 No matter what you’re doing this weekend, this quick and easy avocado BLT pasta salad would be a perfect addition to your day! Cook the pasta as directed on the package before draining and running cold water over it to cool it. Meanwhile cook the bacon and set aside on paper towels to drain and cool before crumbling. Mix everything, toss in the dressing and enjoy! I just adore this combination of flavors Kevin- looks so good!! All of my favorite flavors!! Great recipe! Yes yes yes!! Turning the best sandwich into a pasta salad for labor day weekend is brilliant, doesn't get any better! Oh wow, that looks way better than any BLT I've ever seen! I would love to veganize this, as silly as it may sound. It just looks so creamy, cool, and brilliantly green. I'll take this over a BLT sandwich any day! I made this without the bacon and added hard boiled eggs(cut up deviled eggs) and it was wonderful ! NotesFromAbroad: I'm glad that you enjoyed it! Oh wow this looks fabulous!! I’m always looking for new takes on classics. Thanks!!! This recipe is one of our favorite lunches!! We make a big batch for the week. Hubby wraps his up in a tortilla (like most things LOL) I should start commenting every time we use one of your recipes… but it happens at least twice a week! MAHALO!! This looks so amazing and I can't wait to make the salad but I can't do buttermilk, ranch, or mayo type dressings. Do you think a vinaigrette dressing will work with this type of salad?